Rep. Ilhan Omar stood alone near the back of the House chamber earlier this month, glancing at her phone and seemingly oblivious to the remarkable rebuke being leveled at her. Lawmakers had gathered to vote on a resolution condemning hate speech — legislation sparked by the freshman Democrat’s latest controversial remarks about Israel. After several minutes, she spotted Rep. Pramila Jayapal a few rows ahead and darted toward the Washington Democrat. They embraced and soon doubled over in laughter. “She came up to me on the floor, and she gave me a big hug, and I told her that some of my gray hair was [from her] over the last week,” Jayapal said, recounting the scene in an interview. For Jayapal, the moment on the floor was intended to offer a sense of solidarity that she rarely felt herself when she was sworn into Congress within days of Donald Trump’s inauguration. Just two years later, Jayapal has vaulted from liberal backbencher to co-leader of the Congressional Progressive Caucus — carving out a crucial role within the newly emboldened Democratic Caucus and earning a seat at Nancy Pelosi’s leadership table each week. Jayapal’s colleagues describe her as a mentor with a maternal touch, helping to shepherd a raucous faction that includes a pack of freshman superstars under immense scrutiny on the national stage and even within their own caucus. Her restraint on issues like impeachment and her signature “Medicare for All” bill has made her a trusted ally of Democratic leaders, even as she has also deployed her caucus’ 90-plus roster to occasionally force leadership’s hand. Amid debate on House Democrats’ sweeping anti-corruption bill, for instance, Jayapal and her progressive colleagues demanded a provision that would require Trump to disclose 10 years of tax returns. Pelosi agreed. Like Omar, Jayapal has faced death threats. She’s been vilified by her political opponents. She’s been the only woman of color in a room. Now, in Congress, Jayapal has helped guide the largest-ever group of freshman women of color — particularly the squad of progressives that is frequently under attack. “I’ve been through that myself, so I know the fear of it, and I also know what it takes to steel yourself and get yourself through that,” Jayapal said. For Rep. Rashida Tlaib, Jayapal was a familiar and friendly face after the Michigan freshman ignited a firestorm of controversy just hours after being sworn into Congress with her call to “impeach the motherf—er” when speaking about Trump. 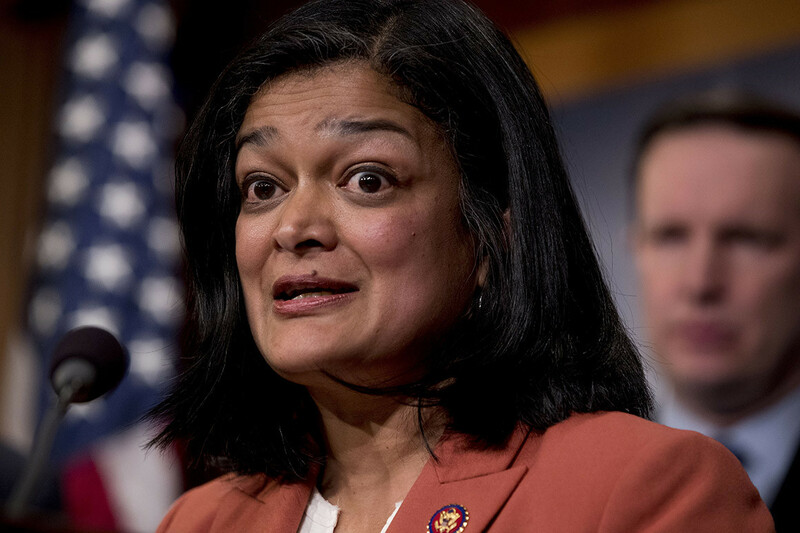 More recently, Tlaib said her longtime friend — the two met as immigration activists 15 years ago, and Jayapal was the first member of Congress to endorse her— pulled her aside before giving a speech on the floor about universal health care with some helpful advice. Personalize your speech, Jayapal counseled, tell the world what the real-world implications of access to health care would mean for your district. Tlaib went on to describe in detail how growing up she thought it was normal her neighbors suffered from asthma, cancer and other serious health problems because of the poor air quality around her Detroit district and how having access to basic health care could have significantly improved their quality of life. It’s not just Omar and Tlaib who seek her advice: Weeks after the election, Rep. Alexandria Ocasio-Cortez (D-N.Y.) came over to Jayapal’s house for a meal of boxed tomato soup — which was broadcast to thousands on Ocasio-Cortez’s Instagram account. After a particularly grueling day at the Capitol, Jayapal will offer a spontaneous dinner invite to her fellow Democrats at her place near the Capitol, where Rep. Jahana Hayes (D-Conn.) said Jayapal will whip up stew with homemade pita bread. Jayapal has plans to have freshman Rep. Debbie Mucarsel-Powell (D-Fla.), her mentee within the CPC mentorship program launched this Congress, over for dinner in the coming weeks. The private gatherings are partly intended to help the new members navigate Congress, like when she counseled Mucarsel-Powell and another freshman, Lucy McBath (D-Ga.), on how to deflect attacks from Republicans — including Rep. Matt Gaetz (R-Fla.) — in the Judiciary Committee. But they’re also intensely personal, discussing how to survive a deluge of daily attacks as women of color. As she’s dispatching advice, Jayapal said, she thinks back to the years of discrimination she faced as an immigrant rights activist in the post-Sept. 11 era, and then as the first Indian-American woman elected to the House. The snubs even followed her to the House floor. Jayapal later wrote on Twitter: “A message to women of color out there: stand strong. Refuse to be patronized or minimized.” Young ultimately apologized. How Jayapal will leverage her newfound influence and if she’ll use it as a launching pad for a more prominent leadership post in the future is unclear. For now, her relatively cautious approach on controversial issues, even as some fellow liberals demand more radical action, is welcome within the broader caucus. Jayapal says for now that her focus is on working with her fellow CPC co-chair, Rep. Mark Pocan (D-Wis.), to elect more progressives to Congress. Jayapal stumped for California freshman Democratic Reps. Katie Hill and Katie Porter and was instrumental in getting the progressive caucus to back Omar during her crowded primary race. Now the campaign arm of the CPC is hiring its first-ever political director, part of a larger effort overseen by Pocan and Jayapal to ensure the caucus plays an even more influential role in 2020, when Democrats will be defending the House majority and trying to win both the Senate and the White House. Jayapal has been endorsed by Justice Democrats, an outside group trying to encourage liberal primary challenges to incumbents, but she has said that’s not where she’s spending her energy. In the early months of Democratic control of the House, the progressive caucus leaders have taken what they describe as a sensible approach to pushing priorities from the campaign trail. Jayapal and Pocan haven’t demanded floor votes on Medicare for All, which they acknowledge still lacks widespread buy-in within the party. Instead, they got Democratic leaders to agree to hold hearings on the proposal for the first time. Her conciliatory approach may surprise those who recall her decision to get arrested at a protest last year condemning Trump’s family separation policies. But Jayapal hasn’t strayed too far from her activist roots, Pocan insists. “My guess is she would gladly still get arrested for something she believes in,” he said.